A few weeks ago I took my Father to lunch at Donnelly’s. We had some great food and beer and shared a few laughs. When we got back out to the parking lot we discovered that someone had hit Rachel’s car and had done a decent amount of damage. 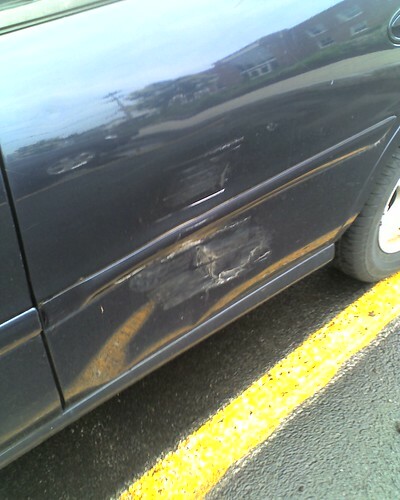 Nothing left for us to identify the perpetrator but the scrapes and dents. A phone call to the police later and we had information on a good lead. Apparently the parking lot for Donnelly’s is monitored by a fancy new $25k security system at Fairport Electric. Sweet. Only problem is nobody working that day had access to the system (or more likely knew how to work it). Good thing is it’s all digital and its kept for an undetermined amount of time. The police officer takes our information and tells us he’ll call when he gets a copy of the video. I just wish people took some responsibility for their actions. Last week we took a vacation with my parents to the Catskills. When Rachel and I went to Lake George a few years ago we climbed Crane Mountain. We enjoyed it so much we figured we’d climb another one this trip. This time we climbed Hunter Mountain (4,050 ft) & celebrated at the top. It was probably the most strenuous hike I’ve ever done (2,250 ft in 2.2 miles).